Love and Little Feet | Thriving simply with little ones. Knights and Princesses – a Double Birthday Party! Thriving simply with little ones. I don’t know what it is about Birthday Parties I love so much – the obvious answers are cake, presents, decorations… yes, all those things are amazing! Now as a parent though, what I love most about birthday parties is celebrating my child. It gives you a chance to really play it up and get your child excited about a party that is for them! Their family will be there, their friends will be there – the people that are most important to them! My son literally talks about his birthday party for the month leading up to it and then continues to talk about it once it is over. It may seem materialistic but I think it is great way to show you child that they are an individual and they are important. Celebrate them! Truthfully my husband has been hesitant about making too big a deal of their birthdays, but when they are only 1 and 3, I think the bigger the better. Now you may be confused – this is a blog about thriving simply. Yes, it is! 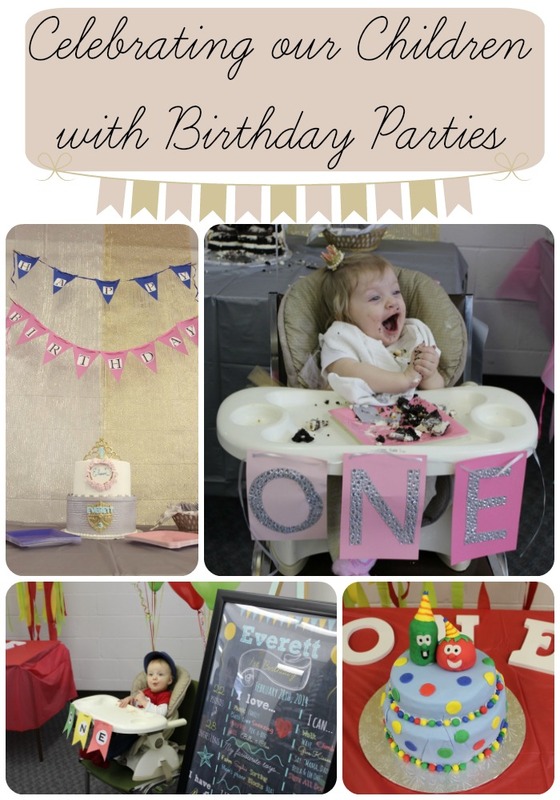 You can plan a party that is simple but lovely and honours your child all at the same time! Pinterest will be your best friend – create a board (preferably secret!) and fill it up with ideas! There are so many age appropriate options now. Don’t forget choosing a theme also means choosing colours – stick to 2 or 3 major colours for balloons, table cloths, paper decorations, etc. *tip* go through your facebook page and write out everyone you want to attend – don’t forget those who aren’t on facebook though! Your venue will depend on how many people you are inviting so you need to complete the above step first. Indoor Playground (can be more costly depending on what you have in your area). We have found 2pm – 4pm to be a good time. After lunch and before supper so we only serve finger foods and cake, also just after an early afternoon nap. This depends on the time of the party you decided on above. Obviously if you are trying to keep costs down finger foods will be a better option. Ask family members to bring different items. *Tip* Don’t forget to “pin” foods that fit your theme and print cute little labels! What did we ever do before Facebook? Make a save the date about 2 months before the party and invite all the attendees you have as friends on Facebook. Make a cute cover photo that includes pictures of your child’s year to add to the event. You can also use this photo as an invitation when you send the details via email to your family and friends without Facebook. If you are going frugal and have completed a save the date and event page on Facebook an actual paper invitation is not necessary. A more cost effective paper invitation option would be making your own on picmonkey.com and then printing them off as photos and mounting them on cardstock – also a little faster turn around! Ahhh the centre piece of a party! If you are talented at making cakes — good for you! You just saved yourself a lot of money! Think about all the people you know that might be willing to and capabale of making a cake for you for cheaper-than-bakery prices. When in doubt try posting an image of the cake you want made on some mommy boards on Facebook, lots of people make cakes and may be willing to give you a deal, especially if it means getting their name out there. Pin, Pin, Pin – don’t stop pinning until you have exhausted the options for your theme, get a friend in there pinning with you! There are so many great ideas out there, use other people’s free printables and templates! Go to Wal-Mart or a craft store (even the dollar store) and buy scrapbooking paper or cardstock in the colours of your theme. You can use this for signs next to food, timeline numbers, welcome sign, bunting with customize-able letters (just print them off your computer and glue them on!). The possibilites are endless! Look on mommy boards on facebook for recently used party decorations – don’t forget to post yours when you are done with them as well! Bonus for making a little cash back as well as not having to store the items! Instead of buying licensed party supplies (think Paw Patrol, Disney Princesses, Spiderman, etc) buy plates, napkins, table cloths and other items in the colours of your theme and then creatively add accents of your theme. For example, we did a train party instead of specifically “Thomas the Tank Engine”. We still had blue and red as our colours but we didn’t worry about all the branded items. It also makes for a less tacky looking party. Make a play list! Spend some time with your kiddos making a party play list the week leading up to the event. Sit together and decide on the music that will fit the theme and make sure the play list is long enough to last the length of the party. Depending on age games may or may not be needed. If the party is for a 1 or 2 year old very minimal games are needed. An “invitation to play” area might be better suited for these age groups. This is such a hard decision to make. When they are little friends and family so badly want to give gifts that even if you ask that people please not bring them they still will. There are lots of creative ideas out there now to replace gifts so if you have some good ones please share them with me! Map out the party in your mind. How long will it take for people to come in and visit, play games if there are any, eat finger foods, eat cake (don’t forget the time it takes to cut it) and open presents. *Tip* If your child is receiving many gifts and you don’t think they have the attention span to open them all at the party ask attendees to please let you know if they would like their gift opened there. Choose 5 or so and bring the rest home to open later. This is so important – don’t ask why it is the last on the list! As a mom I have always taken all the photos of my kid’s parties myself. In the future I would love if someone else could do it but right now it is our way of saving some money. *Tip* Take photos of all the little details around the room once it is set up and before guests arrive and you are too busy and forget. Also, hand the camera off throughout the event to make sure you are in the pictures. More to come in the future about the parties we have planned for our children! I can’t think of any other way to describe motherhood other than as a journey. Every day is different and brings it’s own struggles and triumphs along with it. So I will attempt to share my journey here including where I began and where I am now. As a teenager I never dreamed of the “perfect” wedding like so many young girls. No, I dreamed of my future children. What they would look like and what I would name them! Little notebooks were filled with different first and middle name combinations and they were ever-changing. When I stumble upon them now I laugh at what I thought were cute names! In my high school yearbook my future occupation was listed simply as “a mom”. So, here I am! 10 years and 2 kids later and I have never felt so fulfilled, and so happy that my future occupation was attainable! I am thankful first, to God – for entrusting me with these little souls to raise. And secondly, my husband for always being supportive in my goals as a mom, including quitting my well-paying job to stay home and raise our kids. February 28th, 2013 – 2:55pm. The exact moment my son took his first breaths and looked at me with his big blue eyes – yes, the first thing I remember is him looking at me! I was so, so ready to be his mom! The first few months he and I spent every day together just the two of us while daddy was at work. He wasn’t a good sleeper, but that was okay because I would nap throughout the day with him. Oh the bliss of only one child to care for! He grew fast and always seemed advanced. He taught me to never underestimate my children, just when I would find myself saying, “oh, he’s not ready for that yet”… he would prove me wrong. Now he is our high-energy, extremely inquisitive three year old. March 2nd, 2015 – 3:04am. Our girl surprised us and was born quickly and naturally with active labour lasting only 5 hours – a relief after brother was induced and other interventions followed! We couldn’t have been happier with how things went and were so thrilled she was with us we could hardly believe it! She caught on quickly to nursing and gave us little trouble in the sleep department. Now she is our sweet one year old girl who loves to give kisses,sing, dance and carry around her baby dolls – as girly-girl as they come! During my first pregnancy I was working as a travel agent and had little-to no time to research the items I was putting on my baby registry. I also didn’t have any friends with kids so I based my ideas of what I would want/need on what was available – wow, have I learned since then! We were extremely blessed by our family, friends and church families to receive everything and more than we could possibly need for one 8 pound baby! So I learned as I went! Here are some areas where I have been proved wrong, and I’m happy about that! Breastfeeding – ouch! The first 6 weeks were truly horrible and many tears were shed! I didn’t know about all the community organizations that are available in my region (and there are many). That would have helped immensely if I had someone to guide me, instead I had Google and an extremely strong will. We came out the other side to continue breastfeeding until he was 21 months old when he honestly just stopped one day (I was 7 months pregnant at the time so I didn’t fight it!) The second time around I used midwives and they were a huge help in making sure my daughter had a good latch, yes you do forget what it is like to nurse an infant! We are now at 14 months and showing no sign of stopping! I have been so blessed to have very few hitches along the way with this journey! Diapering – disposable with my son and now I’m a part-time cloth diaper mama. Yes, part-time is a thing! This is one of those, “if I could turn back time things”. I would have cloth diapered my son had I known how easy it was, so I would love to encourage other moms in this department. I know that it can be extremely intimidating with so many options of brands and kinds of diapers but with a little time and research… and money… you can find what works for you. The reason we use cloth is not to save money, although that is a perk! After having disposables on my son for 2 years I started to notice that different brands had different smells – and that smell was chemicals! Once I came to that realization and did some research I tried Honest brand diapers but they were just too costly, for the price of those for a few months I could invest in enough cloth diapers to get me through 2 days at a time. So that’s where we are at now. Cloth during the day and when we are out and disposables at nap, night time and car rides. Sleep – this will have its own post in the future as it does seem to be the “hot-topic” among mama friends a lot of the time. I never saw myself as someone who would co-sleep, a few months into motherhood and I was a firm believer that it was the only way I or my son would get any sleep. So we co-slept for his first 11 months. I was so desperate for sleep at one point when he was waking every 45 minutes that I even considered paying hundreds of dollars for a sleep doula! Yes, we experimented letting him cry once and a while and that was extremely difficult but he did figure out how to self soothe eventually. What I learned was that there is no “sleep formula” and no “sleep training” that will work for all babies. They are all different and will sleep through the night at different ages so just be patient and meet them where they are. Our daughter was a great sleeper from the beginning and became less-so around 8 months, I didn’t mind co-sleeping with her until that hurdle was over and now we are on the up-swing again and she is sleeping for longer stretches. Whenever I am up in the middle of the night I remind myself that the number of years I will experience this are so short – it feels like yesterday I was up every 45 minutes with my son, now he sleeps through the night every night. It’s all about perspective. Babywearing – Well here is something I never thought I would be an advocate for! Again, being a young mom with no “mom friends” and no examples of baby wearers in my life – except TV – my perception was that if you wore your baby you were a hippy. Wow, I am happy to admit I was wrong! It took me a while to warm up to with my son and I should have had him in a carrier right away but I was so uninformed. We wore him on hikes and walks but that was the extent of it. Before my daughter was born I knew I would need two hands to be able to parent my toddler and I still wanted her as close as my son was those first few blissful months. So I asked for a ring sling for my birthday and our daughter was in there within her first week of life. We loved our ring sling until about 6 months when it stopped reaching for it. My go-to carrier now is my Mei Tai (Mao Po brand) and at 23 pounds we still wear her regularly. There is a learning curve to babywearing, no doubt! Be patient with yourself, once you know the basics it becomes so much easier to try different carriers. Caution – it’s addicting! So there you have it – in 3 years I have become a much different mom than I thought I would be but I am so happy I did! I have to remind myself to continue to keep an open mind and never stop learning! There is no one text book that will help you raise your child. What I have found most useful is reading blogs and books written by moms and parenting experts as well as the Bible. Then imparting all those little pieces of wisdom in my every day life with my littles. See all my latest posts and more on Facebook!